Easy peasy! Now dig in. 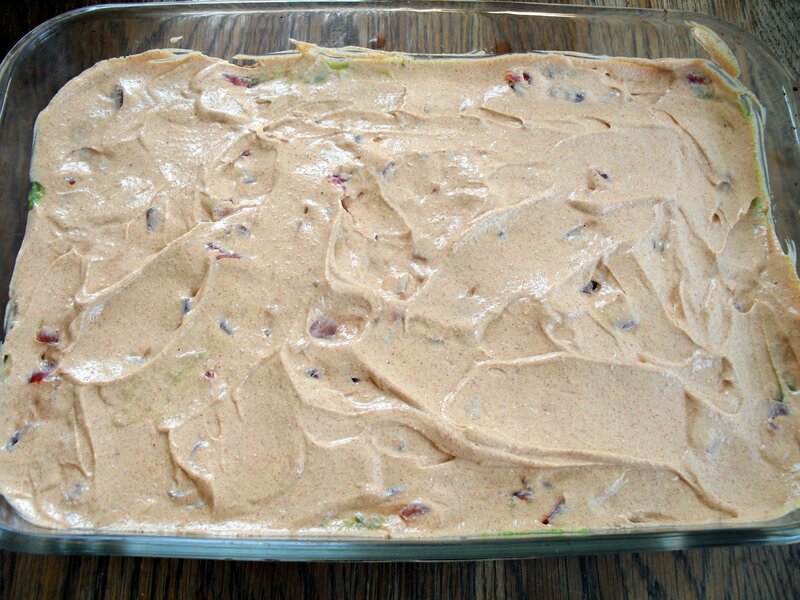 Spread the beans in the bottom of a 9×13 dish. Mash the avocados and stir in the lime juice, salt & pepper. Spread over the beans. Sprinkle the diced tomato over the avocado. Mix the sour cream with the taco seasoning, adding salt to taste if necessary, and spread over the tomatoes. 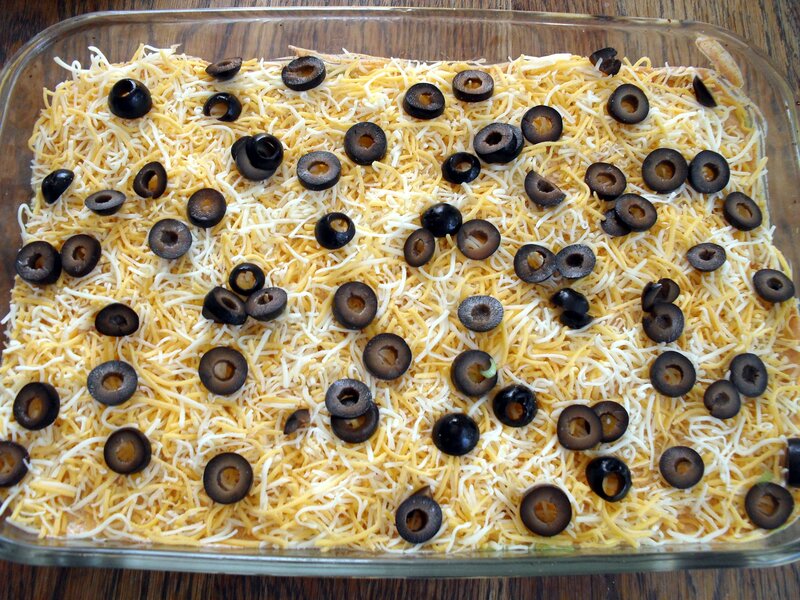 Sprinkle the cheese, then the olives & the green onions. Refrigerate until ready to serve. 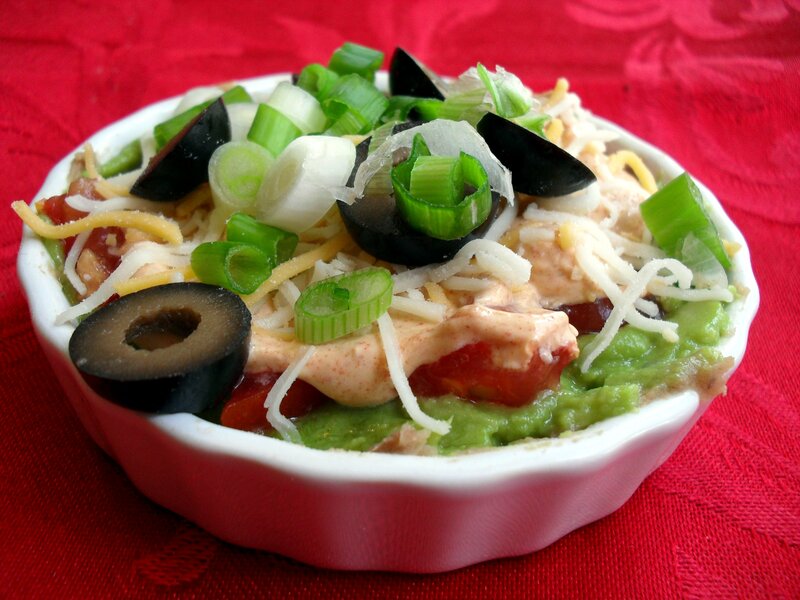 Posted in Mexican, Snacks & Appetizers, Vegetarian & Vegan and tagged 7 layer dip. Bookmark the permalink. That’s funny! I never thought about it before. I do like recipes that call for a whole thing of green onions or parsley or cilantro b/c otherwise I might not use them all before they go bad. I love that your seven layer looks so fresh and delicious. Veronica – I am totally making your refried beans for Monday – we are doing marinated flank steak and having a taco fiesta! I may have to make this too! Have you tried guacahummus from Trader Joe’s? Only 50 calories for 2 tablespoons – so good! Oh, how I wish there were a Trader Joe’s near me! 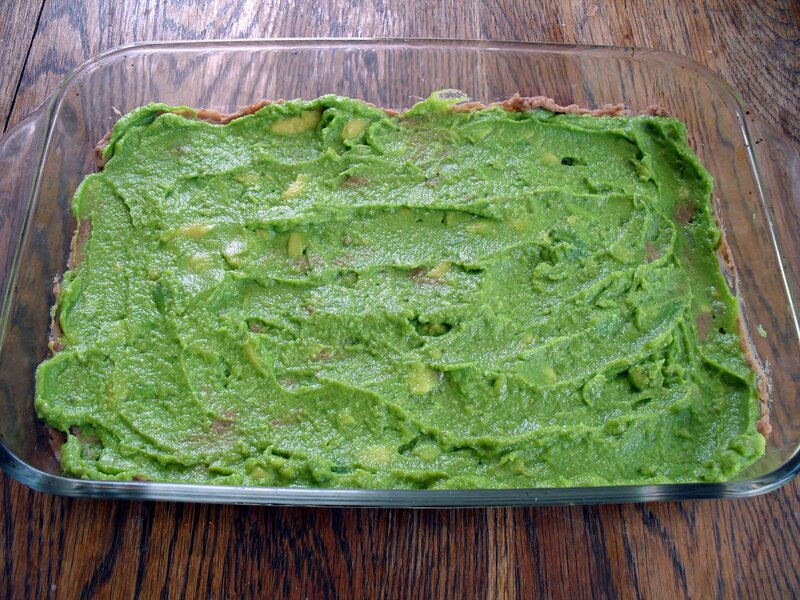 There are so many things I’d like to try–that guacahummus among them! Have fun with your taco fiesta–sounds delicious! 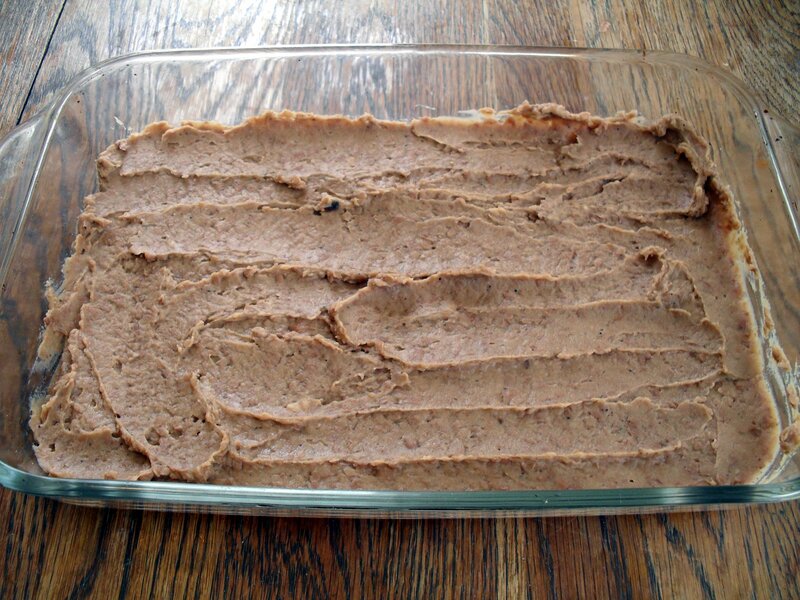 Hee, so there are other ways to use refried beans!! Loving the layers…and the color of the mushed avocados! Can you bake it too? Why didn’t I think of that?! 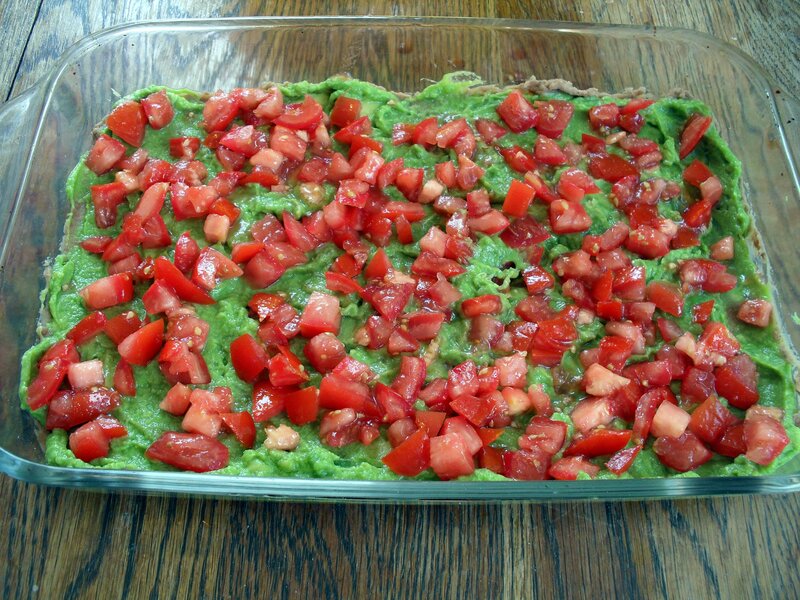 I’m not 100% sure it would work since there’s fresh avocado & tomatoes that head might mess with, but baking it would definitely make the beans softer and the cheese melt. I think it would be good that way…and I think I’d add in another layer of cheese just for the wonderful gooey effect! you have made me soooo hungry right now, I think could eat that whole tray of dip!! Just fry me up some fresh nacho chips and I would be in heaven! 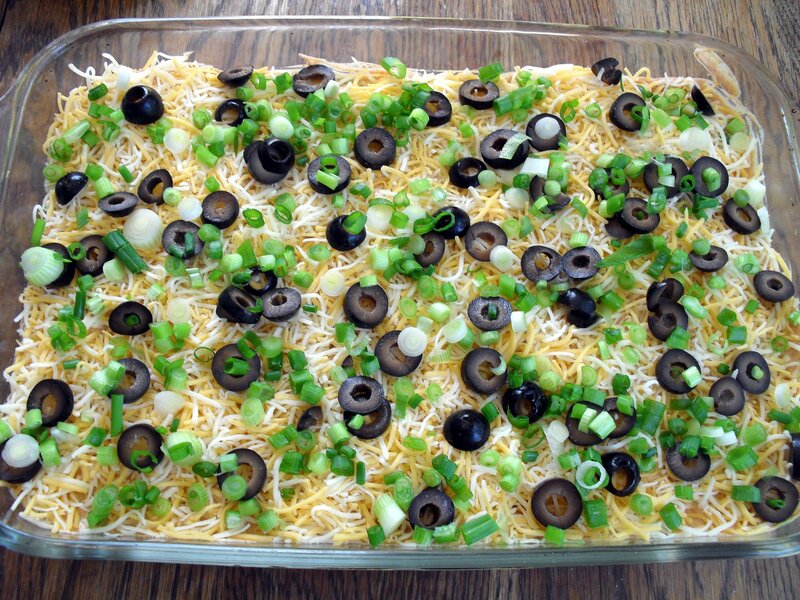 I made a dip similar to this for the Superbowl and it was a huge hit! I’m craving it again now. ;) I hope you’re having a fabulous holdiay weekend, Veronica! 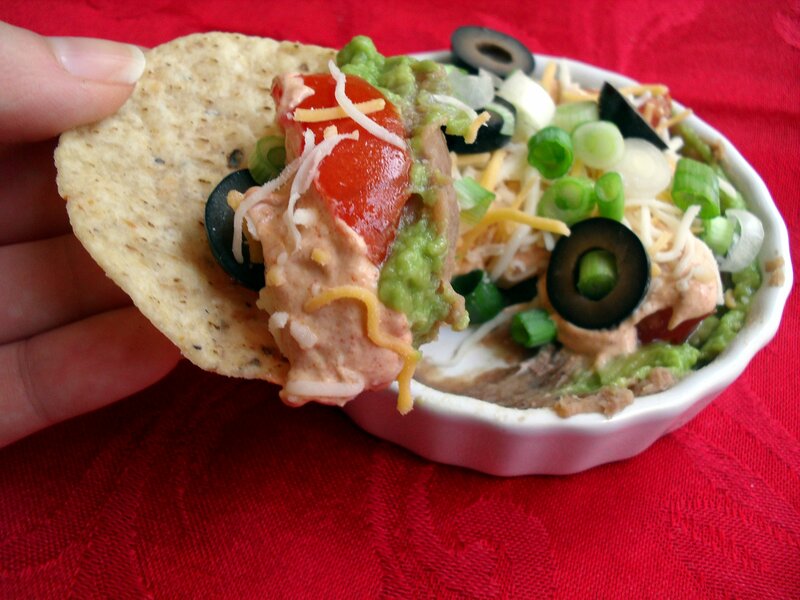 I remember your Superbowl party blog but forgot you made a dip like this! I went back to look at it and it looks almost exactly the same! I like that you combined black beans with salsa for one of the layers. I have always wanted to make this.. now i have no excuse! This looks like excellent dip! I just found your blog through Biz and I love it! I’ll be following, thanks! Thanks so much for stopping by my site… And sorry I stole the blog name out from under you! Haha–you didn’t steal it–you just got it before me! And all of the ideas I had were already taken but thankfully I have a clever husband who came up with the name I use now. 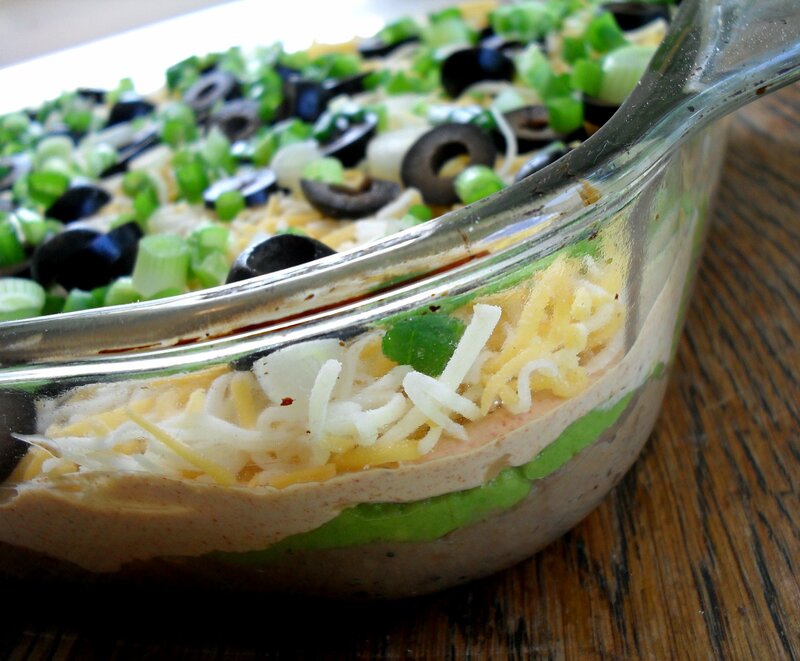 I love 7 layer dip! !